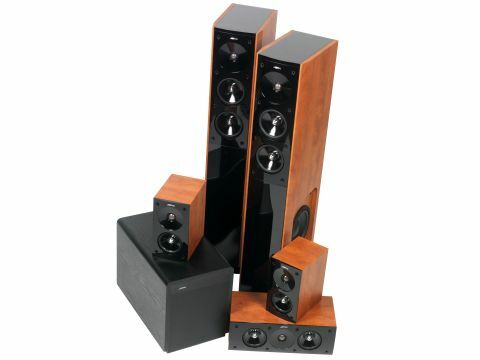 Part of its value-driven Studio range, Jamo's S606 system is straightforward. The S606 HCS 3 main box contains the main, rear and centre speakers. The S606 HCS 6 system here adds a second, smaller box with a SUB 250 subwoofer. Not that the floorstanders need much in the way of subwoofing. Despite being slim, the three-way bass-reflex speakers manage to pack in a 25mm dome tweeter, a pair of plastic-coned 125mm bass units, and a side-firing 200mm paper bass woofer. The reflex port is at the back of the speakers, just above a bi-wire set of speaker terminals. A set of outriggers fit into the base and four dirty great spikes hang off the end of these. The S 602 surround speakers are small, conventional two-way bass-reflex standmount designs with a smaller rear-firing port, featuring a 100mm mid-bass unit with the same 25mm tweeter. Neither the satellite nor the S 60 CEN centre speaker feature bi-wire terminals, just simple single-wire 4mm plugs. But otherwise, the surround and centre have a lot in common. Like the same tweeter and mid-bass unit; two of them this time, flanking the tweeter. All the speakers are finished in a glorious dark apple veneer with contrasting piano black front baffle. The sub completes the deal. With yet another 200mm bass unit, this time coupled to a 250W BASH power amp, it comes with the usual set of level, phase and frequency adjustments on the back panel. The front-firing drive unit has a large rear-firing port, shaped to match the back plate of the subwoofer itself. This system is all about energy. It's a powerful communicator, fast and well ordered. There is a good sense of integration across the five speakers, although the main speakers do tend toward boom more than the other three. This makes effects-driven passages take on powerful proportions. Diction and articulation, especially from the centre channel, are first rate, although yet again the main speakers have a tendency to 'butch up' dialogue. This is not drastic - it doesn't turn Marilyn Monroe into James Earl Jones - but does add stentorian baritone to some voices, adding even more nauseating self-aggrandisement to Clarkson's voice on re-runs of Top Gear. Although it's not the last word in accurate hi-fi-chummy musical reproduction, the S 606 system can make surprisingly cheap amps and receivers spring into life in an impressive manner. And it represents stunning value for money. It's hard not to be impressed.